Recommended LimeWire variation to use is WireShare, which was released for MacOSX early May 2014 and is an upgrade to LimeWire Pirate Edition 5.6.2 from late 2010. Many bug-fixes and improvements and is being constantly improved. Can run with the latest Java version. If you prefer earlier LW versions, then see below. If you intend to use LW 5 or LPE, then you will need Apple's Java 6 instead of Oracle's Java 7. Java 6 for OS X 2013-003 via Apple - Java update for OSX 10.7-10.9 (if that link dies, try Java 6 2015 for 10.7-9 via MediaFire.) WireShare 5.6.4 or higher can run with Java 6, 7 or higher. Mirror download site: here (4Shared) and Mirror Download links at FileCloud. 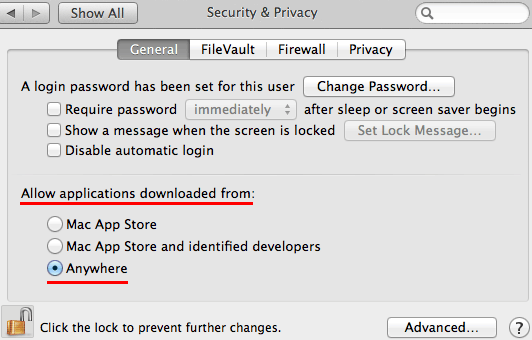 But first, check LW version compatibility with your OSX below. * If you are downgrading from LimeWire 5, we highly recommend LW 4.16 or LW 4.14.10 instead of LW 4.18 since it handles LW 5's incomplete files much more efficiently. Incomplete files from LW 5 go stagnant in LW 4.18 & with problems of already downloading status recognition. LW versions from 4 to 5 are listed on this page. Under no circumstances attempt to run versions of LW 5.5 after LW 5.5.10 or earlier than LW 4. (exceptions are the LW 5.6 beta, LPE or WireShare.) . LW 5 installers are listed in green half way down this post. If you are presently a LW 5.5 Pro user, then your activation will hopefully be automatically recognised for either LW 5.5 or 5.6 Beta. Else the program is used in Basic mode. It is not possible to activate new Pro 5.5 users even with the Pro key code. For LW 4.16.7 click on this link: # LimeWire 4.16.7(click on link) _ for Mac OSX (10.4 or higher, Java 5+) (22 April 2008.) _ Please read THIS first before installing!. LimeWire 4.18.8 for Mac OSX (10.4 or higher, Java 5+) (19 Sept 2008) or mirror download here. *For this download link, click on Free User or Download, then on following page click on the blue Download button. For anybody using LW 4, you 'might' have a problem where the Preferences does not show under the usual LW menu. One answer is to go to Library tab, select Shared Files, then press the Configure button. This will take you to the settings. Another possible answer is to install a different skin, then see if Options appears in the Option menu on the actual LW GUI interface. All LimeWire 5 versions are Universal and 32 + 64 bit compatible. But can only run on OSX 10.5 or later. ie: OSX 10.5, 64-bit Intel only, OSX 10.6, 32-bit (non-intel) and 64-bit. Java 6 is required. LimeWire Pirate Edition 5.6.2 . Released Nov. 9th, 2010. (No legal notice, runs in Pro mode & connects easily; is Mac version of this. * Portable LimeWire 4 and 5 versions: There is now a LimeWire Pirate Edition 5.6.2 Portable version, a 5.4.6 Portable version and a 4.18.8 Portable version I put together. See the iFileIt link for either version. These can be used from any external drive, flash disk, etc. instead of installing onto your computer. Their settings and shared folders are kept within their own folder so will not affect any other settings if you already use LW. But note: do not use two LW's running simultaneously.The Portable 4.18 will run on OSX 10.4 or later. If you keep the portable on a portable disk, you could also connect it to another mac computer. Any of the LW 5 versions will only run on OSX 10.5 or later. Links: 5.4.6 Portable here or here, LW Pirated Edition Portable here or here. LW 5.6.0 was a Beta released a couple months before 5.5.10, it did include some additions which had not yet made it into the mainstream program. For those who wish to use 5.6, . . LW 5.6.0 (Released 20 April 2010.) . . LW 5.6.1 (Released 10 May 2010.) . (these versions are safe to use!). * Warning, for any OSX 10.2 (or later) users who have used a later version of LW, MUST delete their LW preferences folder whilst LW is CLOSED BEFORE installing a 4.8.1 version. Otherwise this version LW will behave abnormally & not very happily. 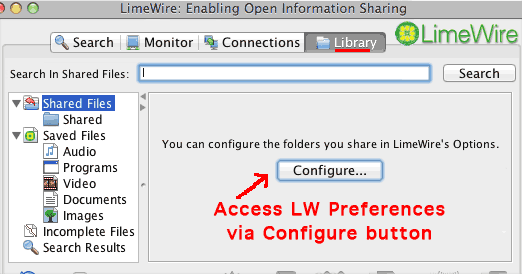 LW Prefs folder is found here: /Users/your_username/Library/Preferences/LimeWire. 4Shared.com download instructions (click thumbnail to see larger view): (Morpheus Fix download example): Please note, since March 2012 you need to be a member of the 4Shared site to download, though membership is free. Alternatively use the FileCloud mirror site. LimeStart application installer for any LimeWire 5/LPE version is attached below. This will prevent LW deleting your connection file if LW has not been used in 30 or more days. LimeStart acts as an insurance against that happening. Described here. (LW 4 did not behave like this so the LimeStart app is not necessary for LW 4 users.) All the LW 5 version installers above are now packaged with LimeStart for optional use. Updated LimeStart installer to improve performance and added some localised languages for the installer.